“Carolina Beach residents pleased Road Diet is over,” reads one headline. “When Gov’t Imposed ‘Road Diet’ to Control Drivers, It Ended as Many Diets Do – With People Hangry,” reads another. Main Avenue’s new “road diet” has been met with much reaction. The Bismarck Tribune recently published an article of praise, citing positive reviews based on attendees at a public informational meeting. There is evidence to the contrary, however. Two online polls, one conducted by this site and the other by KFYR-TV, showed overwhelmingly negative feedback, with only 25% and 12% voting in favor of the changes. Even within the Tribune’s own Facebook feed, much of the commentary is negative. 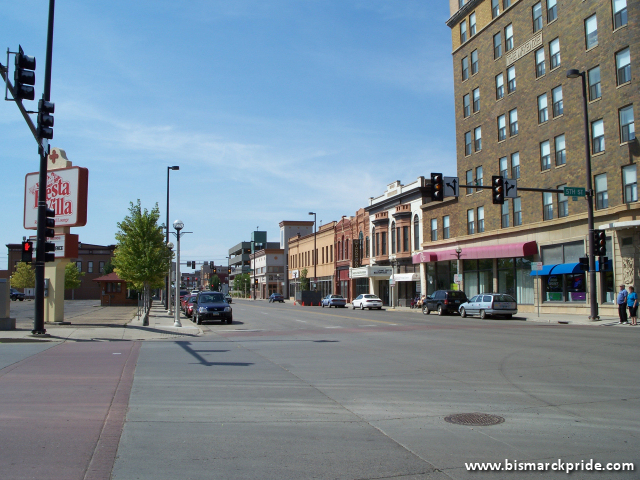 It is difficult to concur that reducing the capacity of one of Bismarck’s busiest roads improves traffic. Congestion and traffic back-ups are prone to increase. In fact, the Federal Highway Administration (FHWA) acknowledges in a report that the likelihood of congestion increases when road diets are implemented on roads topping 20,000 vehicles per day, which Main Avenue is approaching. Admittedly, there are benefits to the changes. The wider driving and parking lanes, in particular, meet high praise. The dedicated left turning lane, in itself, would also make sense in most circumstances. Except, in this case, a left turn must now yield to a line of through traffic twice as long as previous due to the halved capacity. Protected turn signals would only add to the length of through traffic wait times, further increasing congestion. One news article even suggests that road rage incidents increased with the implementation of their own local diet. A quick search online reveals that road diets are not well-favored in other communities. The Carolina Beach in North Carolina, the Silver Lake neighborhood of Los Angeles, Gainesville, Florida… these are just three examples of localities who reversed their controversial diets. There are others. Numerous alternatives have been suggested, including removing parking along the congested areas of Main Avenue, resulting in four through lanes with separate left turns. Certainly, the argument against this lies in the already sparse downtown parking, which will likely get worse with the implementation of Depot Plaza. As previously suggested, establishing a pair of east-west one-ways through the length of the city, similar to 7th/9th, is a viable consideration. Rosser and Broadway would arguably be the best candidates; removing the nuisance Thayer Avenue one-way in the process. Residents are encouraged to share their thoughts on the demonstration project via the city’s website: http://www.bismarcknd.gov.